Words are pretty important to humans. Not so much to canines. 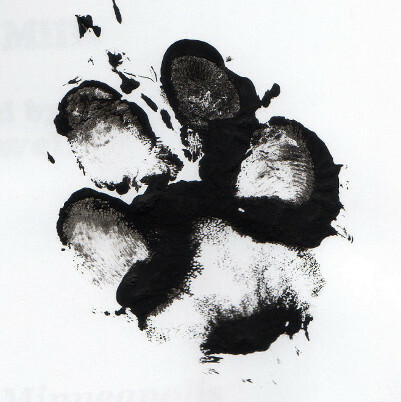 Dogs usually pay more attention to a tone of voice than to actual words. I like words. At least I like to hear words spoken by humans. It’s really more about the sound than the actual word. 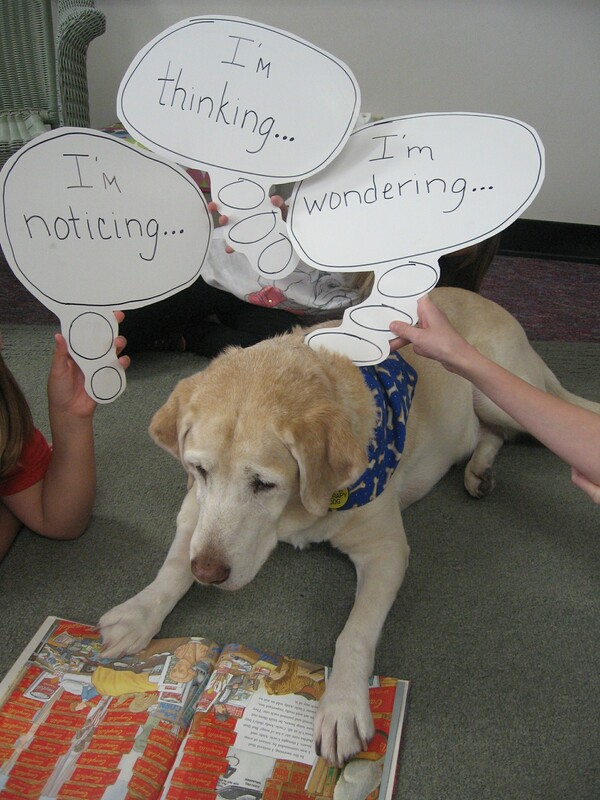 I have some particular favorites — treat, French Fries, ball, river, YES!, find it, library, kids, Dr Bruton, Ms Brandt, Good Girl! And there are some words that I don’t like to hear — No!, leave it, no more, go lay down, that’s enough, off, not today. There are a lot of words that I like the sound of when I hear them spoken, but I don’t know what they mean. 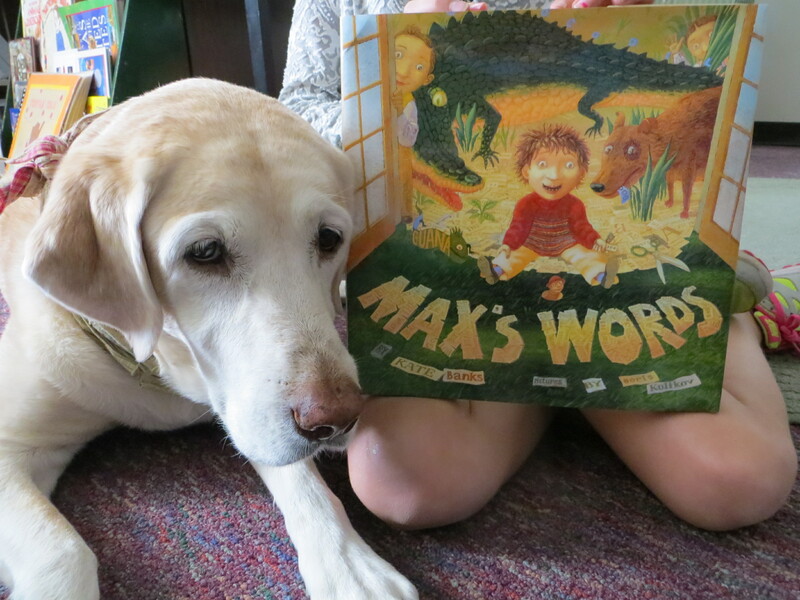 Mrs Brandt, my favorite reading teacher who always has banana chips and the best pillows, has a great book called Max’s Words about a boy who collects words. Max’s Words is written by Kate Banks and illustrated by Boris Kulikov. Now that’s a nice sounding name! Max’s Words was published in 2006 by Farrar, Straus and Giroux. Max has a brother who has a fabulous stamp collection that everyone admires. And he has another brother with a coin collection that everyone admires. Max wants a collection for himself and decides to collect words. He starts with simple words that he cuts out of magazines and newspapers. His collection grows and grows and he starts sorting them in different orders. Then he discovers that when he puts his words together in different ways, they become a thought. And those words and thoughts can be strung together to create a story! Now his brothers get interested in Max’s word collection and they all end up working together to create a magical story. The illustrations in this book are as fabulous as the words. They build on what the words are saying and make those words come alive. This is a most fabulous book all around!!! Following in Max’s footsteps would be a fun thing to do with a class. Let them start their own word collection. (Or you might give them a whole bunch of already cut out words). Then see what kind of stories they can create. Some magazines and some scissors can make magic happen! A favorite game at my house is the Dictionary Game. One person looks up a word in the dictionary and says the word to the other players. Then those players write down what they think the word means. The word person collects all the definitions along with the real one that he has written down and reads each one out loud. The other players pick the one that they think is the real definition. If you get it right you get a point. If you wrote a definition that fools the others you get a point. When we’re in a classroom, sometimes we play another dictionary game where everyone has a dictionary. The Mom Person says a word and the 1st one to find it wins a point. Now here is a little bit of connected trivia. I love connections. I recently did a post about a book written by Charlotte Zolotow. There is a book award named after Ms Zolotow. Another book written by Ms Banks, the Night Worker, won the Charlotte Zolotow Award! This is Perfect Picture Book Friday and if you would like to find a great list of books and resources to use in you classroom or at home, you should visit Susanna Leonard Hill at her blog HERE. I’m working on my collection! How about you? Any favorite words? Do you have enough words for a story? 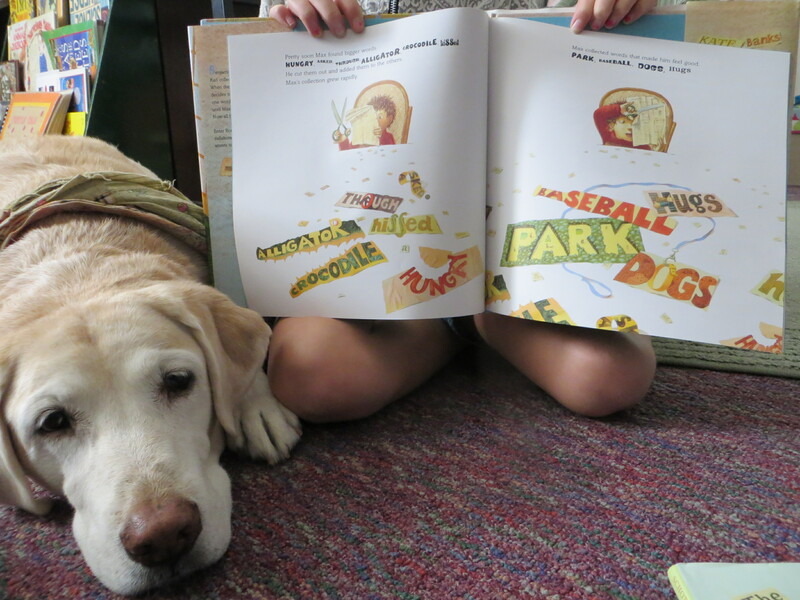 This entry was posted in children's books, PPBF, reading dogs and tagged Boris Kulikov, collecting, dogs, Kate Banks, PPBF, Susanna Hill, words by readingwithrhythm. Bookmark the permalink. TWO Facebook pages?! I’ll have to check those out! That Chaser is my idol. He makes my brain dizzy. Wow, this sounds like a really fabulous book. I love that he’s a word collector. What a great idea. Thanks for the review. Do you collect words? I think you would like this book. It’s very clever. Any book about words gets an A in my book. I love books about collecting words – and have a few word collections myself! Thanks for sharing this book… gotta look for it now. You sound like Mrs Brandt!! She’s all about words too! You’ll like this book! The first video doesn’t open for me in England, but the second does so I’ll enjoy that one tomorrow. Now I have to prepare supper for friends coming around. those German words sound buzzy in my ears. I need to learn some. Wanderlust is a good one, I think. I do know some Spanish words! You have a fun weekend! Yes a very interesting post, Rhythm. I like the idea of a child collecting words. Such a great way to encourage vocabulary in a fun way. Loved the videos and your activity suggestions. Thanks Ms Tilton! Isn’t that a fun idea! And the illustrations in this book make it magical! I. Love. Words! The dictionary game is AWESOME, totally borrowing it! Help yourself! The family always has a fun time with it. Lots of laughter! Lurv this book! Great PPBF pick! Thanks! I lurv this book too! PS – How ’bout that Chaser? How bout Chaser indeed! I’m jealous of his toy collection! Forget all the words! Who needs words? It’s all about the love. I don’t know about that — I know we get tons of catalogs around here that the Mom Person likes to shop in. And there are tons of magazines at the library, so they’re still out there. also newspapers. And you could just have the kids go through the dictionary and find words they like and write them down. Words are everywhere!! I love the sounds that some words make – and playing with words too Rhythm. Max’s Words sounds like a great book. I would like my students to collect words. The book reminded me of a couple others that I enjoy – The Alphabet Tree by Leo Lionni and Martha Speaks (I thin you will really like that one). I know about Martha Speaks but I don’t know The Alphabet Tree. I’ll have to look for that one. Thanks! Love the Zolotow connection. I know Kate Banks personally. She is not only a gifted author, but a fascinating woman. I have reviewed many of her books and am very fond of this one. That’s cool that you know her! I think she must be a fascinating lady to write a book like this. I read that she lives in France, and I think I remember that you lived there as well. You must know her from there? She and Mr Kulikov make a super team! I’ve picked out some of her other books to put on my wish list. I absolutely love the idea of a word collection, and this book sounds great. The Dictionary Game is one of my favorite games EVER! I’m so glad you told people about it! Someone else who plays dictionary games!! Awesome!! I usually get to be the referee! Indeed. 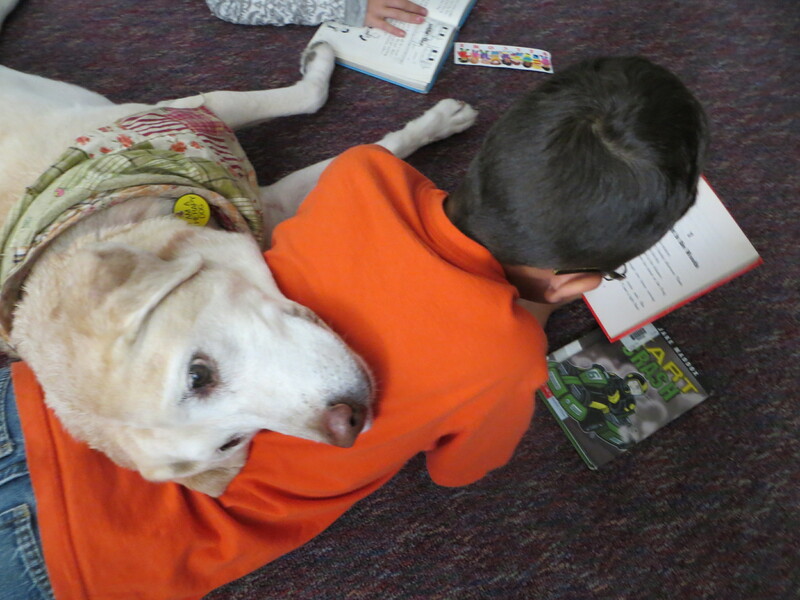 A fabulous book and a fascinating dog. . .thanks for sharing them with us! Your welcome Ms Jarm! Thanks for stopping by! Oh, I’ve read this one and love it. It might be paired with Oliver Jeffers’s INCREDIBLE BOOK-EATING BOY. A bet the two of them together would make a great lesson. Oh, yes indeed!! One of my favorite ever books!! I think Max and Henry could be best buddies! That Chaser is pretty amazing. I’m quite jealous of his toy collection. I would think that you were already a word collector! Looks like a fun book. Looking forward to reading this one. Love a collection of words. It is a fun book. You have to see the illustrations to really appreciate how fun it is! I think you’ll like it! Great book selection! I love the Dictionary Game.I used to play it with my classes when I taught middle school language arts. My family used to play it too when we all got together. It’s fun to hear that other families play the dictionary game!! Maybe there should be an online dictionary game like they have scrabble with friends and those candy games I hear about. I’m surprised you haven’t heard of this one Ms Kirkfield. It’s a great one!